Eight new products are scheduled to arrive this week with a mix of hockey and basketball leading the way with two brands apiece for the sports. The second series of Upper Deck hockey cards arrives with Jack Eichel the Young Guns Rookie Card to chase, while Leaf goes high-end with 2015 Leaf Ultimate, a brand loaded with nothing but hits. There are 50 Young Guns in Series 2 and they are found one in every four packs, while memorabilia cards are found one per box in both hobby and retail boxes. Call this week the calm before the storm. There are just three brands on the schedule for release this week — one football, one baseball, one gaming — in advance of 11 coming next week. For football fans, Panini America presents 2015 Donruss Signature Series, which includes four autographs per box. The base set consists of 400 signed cards and every box includes an autographed rookie jersey — or a multi-auto booklet, which is found one per case. It’s a week for hockey fans and non-sports/gaming collectors as that is all that’s on tap this week with just five releases on the schedule. Set to arrive on Wednesday from Upper Deck is the latest NHL brand, 2015-16 SP Game-used, which will include five cards per box — and all of them will be autograph or memorabilia cards. There will be a mix of rookies, patches, Stadium Series cards, gloves, pads and more in this high-end product. This week’s new release schedule is a bit icy, a bit historic and a bit patriotic despite there being just six products set to arrive in hobby shops. Coming on Wednesday is 2015-16 Upper Deck Trilogy hockey, which will include one rookie autograph, one memorabilia card and one “premium” autograph per box. Among them will be Tryptichs like you can see above and variations based on stats and debut seasons. The wide mix of possibilities should make these eight-pack boxes ones that get ripped quickly. Hockey, New Buzz, Soccer2015 Leaf Ultimate tennis, 2015-16 Upper Deck Trilogy, 2016 SuperBreak Super Game-used, Historic Autographs, NHL, Panini America, Upper Deck, USA Soccer, Yu-Gi-Oh! Panini America starts off the new year with not one but four new products scheduled to arrive this week — from four different sports, too. Meanwhile, there’s only one other brand on the calendar. The biggest for most collectors is the arrival of 2015 Panini Contenders football cards with the annual chase for the Rookie Ticket autographs one that’s been a mainstay for years. Which ones will be short-prints? Which ones are variations and which ones aren’t? We’ll find out more beginning Wednesday. Each box includes at least five autographs — and it looks like some of them might be coaches who have never signed before. Will those be short-prints? Should be interesting to watch. Another holiday week leads to another abbreviated release schedule for trading cards with just five brands on the tarmac and set to arrive beginning tomorrow. We’ve got one from Leaf Trading Cards, one from Cryptozoic, one from Topps and two from Panini America and that’s where we’ll start off. This week’s NBA release is 2015-16 Panini Court Kings, a rookie-heavy art-style product that will include one autograph and one memorabilia card per 10-card box. It will also include box-toppers. This one will feature on-card autos as well as one Hot Box delivering extras in every 15-box case. After a heavy week of releases and some delays this month, this week is a bit lighter — but that doesn’t mean it doesn’t have its highlights among the four brands set to arrive. We have three baseball sets on the schedule and the return of Bowman’s Best along with the launch of Topps Strata as a standalone brand. Throw in a USA Baseball set on the schedule and one high-end college brand from Panini America (keep reading) and that’s it for the week. The format for 2015 Bowman’s Best will be similar to Finest with two mini-boxes each yielding two autographs (four autos per in every master box). The format for 2015 Topps Strata is all hits — every box includes one autograph and one Relic and that’s it for the acetate-layered cards. If you haven’t felt the awakening yet, you will by Friday. That’s the day that Star Wars: The Force Awakens arrives and that’s also the day that the galaxy right here right now gets a new set of Star Wars cards — one that includes full scenes from the film and the most-important thing of them all. After a lull in new arrivals around Black Friday, there are a whopping 13 new products set to arrive this coming week with some heavy hitters in baseball, the college ranks and even non-sports territory on the calendar. The biggest just might be 2015 Bowman Draft, which will arrive redemption-free on Wednesday with a selection of the newest MLB draft picks in their official MLB uniforms. Autographs for 31 of the 35 first-round picks will be found in this one. For prospectors, this is perhaps the biggest day of the year … every year. After Black Friday, the hobby presents seven new products this week with a pair of NFL and a pair of NBA products leading the way from Panini America and Topps. In football, arguably the biggest of them all is 2015 Topps Triple Threads, a high-end brand that features “the best retired legends, veteran superstars and game-changing rookies in the NFL.” Each box will include an autographed triple Relic, a triple Relic, a rookie auto Relic and a rookie jumbo Relic inside with all numbered to no more than 99 copies. Also coming from Topps for football will be the first gridiron take on Tek with one of the hit brands of last season in MLB getting retooled for the NFL. Inside every box of 2015 High Tek will be one autograph, one parallel and six base cards all printed on the colorful and enhanced acetate stock Tek was known for in the past. With Black Friday nearly here, the number of new releases this week is low — just five products are on tap for arrival this week. The biggest release of the week for football is 2015 Panini Immaculate Collection, which will bring a new crop of high-end autographs and memorabilia cards to collectors. This one will include five autograph or memorabilia cards per box — all from a selection that includes multi-player autos, massive patches, cleat laces and much more. After a few heavy weeks for new releases — and with Black Friday still to come later this month — this week’s schedule for new products just feels lighter. But it still packs some punch. For football collectors, 2015 Topps Chrome is set to arrive on Wednesday with one rookie autograph in every 24-pack hobby box. It comes on the heels of Topps Finest‘s colorful and delayed arrival and Panini Prizm‘s expanded rainbow hitting last week, but the allure of Superfractor autos has been among the strongest out there for football cards in recent years. It’s also not the only heavyweight coming. There are several new products on tap for this coming week with some brands that had experienced some delays finally getting the nod along with some memorabilia-based and cut autograph releases. The biggest arrivals will be 2015 Panini Prizm football cards and 2015 Panini Contenders baseball cards. For Prizm, it’s the return of the rainbow of parallels with plenty of new touches and inclusions sure to get football fans going. Standard Prizm boxes will include two autographs per, while jumbo boxes will double that. New this week are seven products for three of the four major sports along with the latest MMA release and one non-sport set. 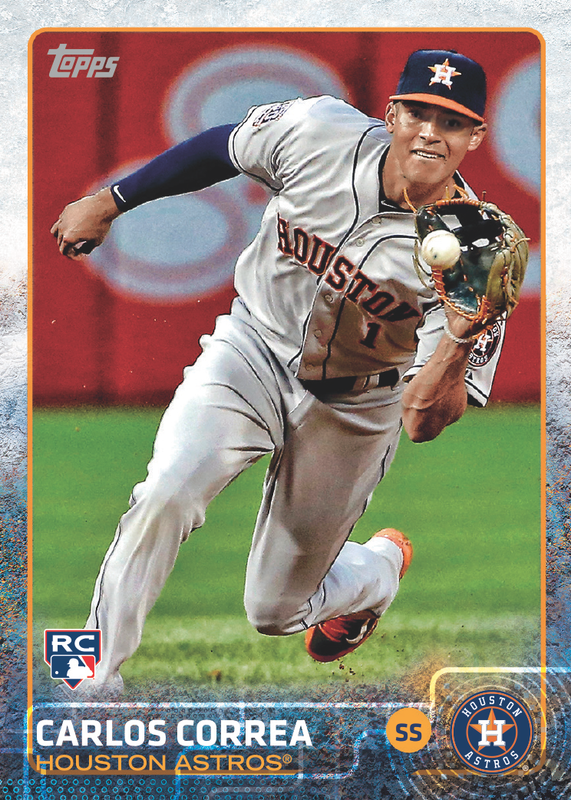 Leading the way is Topps’ third and final installment of its flagship baseball card set as 2015 Topps Update arrives on Wednesday. This 400-card release includes all of the parallels and inserts collectors have come to expect from the first two releases as well as a few surprises. Standard hobby boxes will include one autograph or Relic, while HTA Jumbo boxes will include an auto and two Relics.